Over the past few years, Weblogs (or blogs) have taken the Web by storm. According to the Wikipedia definition, a Weblog is "a Web application which contains periodic posts on a common Webpage. These posts are often but not necessarily in reverse chronological order." Basically, if you publish content on a periodic basis, a blogging package may simplify your publishing workflow. This article assumes that you’re familiar with the basics of blogging and would like to start your own Weblog; for more information on what blogging’s all about, see Aaron Brazell’s article, The Blogger’s Primer. Personal: an individual may want a blog to help keep family and friends informed of what’s going on in their lives. Why Use Someone Else’s Software? Many Web developers will scoff at the idea of using somebody else’s software. This is especially true when the software differs greatly from the specific needs a client has. However, when it comes to Weblog software, there’s little reason to fear using a pre-written package. Many of these packages have years of development work behind them; they were not thrown together over a weekend and are consistently stable. Another good reason to use a pre-written package is the feature set. It would take any developer months to write from scratch every feature in today’s top Weblog software packages. For most of us, this is simply not a good use of our time. Besides, if you’re choosing to publish your writings on the Web, you’ll probably want to spend more time writing and less time coding. So, you’re considering using a pre-written package for your blog. You may still be confused about what exactly is out there, though. In short, there are two types of packages you can use: the hosted service, and self-hosted packages. If you would like to start publishing on the Web, but you don’t have any Web hosting, you may want to look into a hosted service for your needs. These services include TypePad, Blogger, LiveJournal, and more. All of these services are managed for you, so you never have to worry about technical maintenance of your Weblog: instead, you can focus on your blog’s content and appearance. You can get up and running with these services within minutes of signing up for an account, which is great if you need to publish in short order. Many of these services, like Blogger, are free, but some, including TypePad, may charge a nominal monthly fee. Since these services are well-known and their Websites explain their offerings in great detail, the hosted services will not be the main focus of this article. If you have Web hosting available (or are willing to purchase hosting) and feel that the benefits will outweigh the drawbacks of maintaining your own blog installation, you’ll want to consider a self-hosted package. These include Movable Type, WordPress, and Textpattern, all of which I’ll review in this article. As I said earlier, these packages will require you to perform installation and maintenance tasks. Some hosting companies have made the installation process a little easier, allowing one-click installation from a browser-based control panel. Check with your hosting company to see if this functionality is available to you. Like hosted services, these packages may be offered free of charge, or for a fee, depending on the package you select and the reason why you’re using it. Let’s look at some of the market’s major offerings now. Movable Type is the brainchild of Ben and Mena Trott of Six Apart. 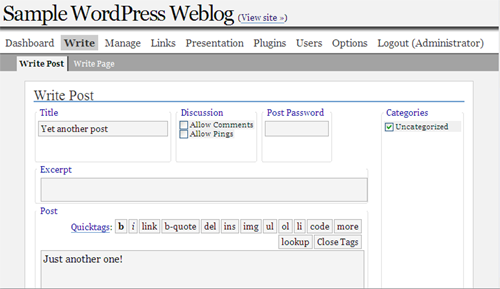 In 2001, Mena was maintaining a Weblog by creating and editing HTML pages manually. Movable Type was created to make publishing and managing her Weblog a much simpler process. Version 1.0 was released in October of 2001; the current version as of this writing is 3.17. Movable Type was the first major package available for Weblogs, and is arguably the most popular package in use today. It is written in Perl, a popular scripting language that runs on nearly every operating system, and can use a variety of databases to store blog content, including MySQL, SQLite, Berkeley DB, or even PostgreSQL. A wealth of plugins that can bring new functionality to your basic installation are available for Movable Type. Movable Type is quite easy to manage. It features a template editor that allows you to alter the look and feel of your Weblog, and offers an intuitive template tag language to provide greater control over the type of content that’s displayed on your templates. Movable Type has the simplest administration interface of the three packages reviewed, offering easy access to commonly-used features, and in-depth documentation. And, of the packages reviewed, this is the only one that can run multiple blogs from the same installation. This means that you can run many blogs simultaneously (for example, on a group site at which each member has his or her own blog), yet you can manage them all from one location. Six Apart also offers paid support for Movable Type, which is great for those who use blogs in a corporate setting. Below is a screenshot of the Moveable Type admin interface. Movable Type is not an open source project like the other packages reviewed, but an unsupported, personal use license is available at no cost. This version of Movable Type limits use of the software to one author and three blogs per installation. If you need more authors or blogs, or would like to purchase support, versions of the software that include these features start at US$69.95. Various pricing levels are available for business, educational, and non-profit licenses: check the Movable Type pricing page for details. No blog software is perfect. Since the Movable Type software is ubiquitous, it’s also a more likely target for spam and other attacks than some of the less widely-used packages. Plugins are available to help bloggers fight spam, and no Movable Type installation should be without one. It’s because of the potential for spam and other attacks that a few hosting companies still will not allow the installation of Movable Type on their servers: check with your hosting company to see if Movable Type is allowed. Movable Type’s static publishing functionality is both a blessing and a curse. The benefit of static publishing is that it provides bloggers a physical output of their Website, which can be backed up easily. However, making changes, such as modifying templates, can become a tedious process across a static blog, since you have to wait for every file to be updated before you can perform another task. Once your blog contains more than a few entries, rebuilding it will take a very long time. Movable Type also has the unfortunate honor of being the most difficult package to install. The installation instructions that come with the package are clear, but a lot of configuration needs to be done before you can log in and publish content. Installation of Movable Type takes about an hour, on average, to complete, while the other packages reviewed here were installed in under 15 minutes. WordPress originally began as a fork of an older open source package known as B2. The original developer of B2 had stepped away from the project, so Matt Mullenweg decided to form a new project using the code contained in B2; he called that project WordPress. Like B2, WordPress is open source, which means that any user can modify the source code to better meet their needs. Because of its licensing options and feature set, WordPress has become very popular among bloggers. The current version of WordPress is 1.5.1. WordPress is written in PHP and uses a MySQL database to store content. This is great for most Web developers, since PHP is a popular language, and MySQL is a free and popular database. 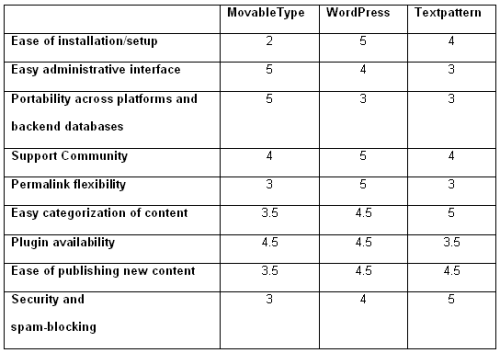 Like Movable Type, WordPress can run on a variety of platforms: most hosting companies will already have installed everything you need to run a WordPress blog. Of all the software packages reviewed, WordPress was the easiest to install. The installation guide is called "5 Minute Installation", and it lives up to its name. You really can go from zero to blogging in five minutes if everything goes smoothly during your installation of this software. WordPress can be used for much more than blogs. 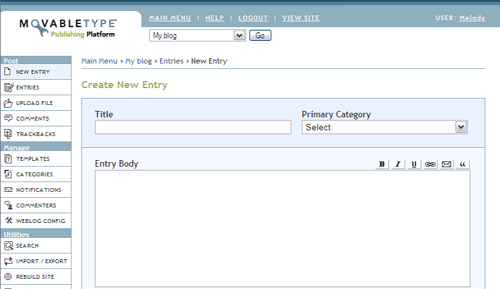 WordPress’s "Pages" feature lets you create pages that sit outside of the structure of your blog entries. This is useful if you would like to create pages that don’t necessarily relate to the areas on which you normally publish (for example, an "About Us" page on a corporate blog), but which you’d like to manage from a familiar interface. With features like Pages, and a little extra configuration, WordPress can be used as a fully-fledged content management system. WordPress is licensed under the GNU General Public License (GPL). This means that you’re free to modify and distribute WordPress’s source code as long as the code you redistribute is also licensed under the GPL. WordPress is available as a free download. Because it’s free, paid support is not available, but a very friendly and active community is available for help at the WordPress Support Forums. While WordPress includes better spam fighting features in the base installation than do some other blog packages, it’s still a big target for spammers because of its large installed base. Taking further measures to combat spam through plugins is recommended. WordPress may not be the friendliest package for a non-technical user to manage. WordPress’s templates use PHP code, rather than a tag-based system, so it may be slightly more difficult for non-developers to change the look and feel of a WordPress blog than one created by some other package. Overall, the administrative interface feels more suited to advanced users than does that of Movable Type. However, if you’re the type that loves to tinker, WordPress is probably the system for you. Finally, WordPress has no multi-blog feature (like that offered by MovableType) in its official distribution. A multi-blog version of WordPress is available, but as of this writing, it’s still a separate project and some may feel uneasy about not using the official WordPress releases. Textpattern began as the brainchild of author Dean Allen. Textpattern was created to ease the painful process of publishing Web content, and to make it easy for those who don’t know HTML to publish on their own. Textpattern can be used to manage many different types of content, but its most common application is for blogs. The current version as of this writing is 1.0rc4. Like WordPress, Textpattern is written in PHP and uses a MySQL database to store content, which means that it will run on just about any platform that WordPress can run on (though Textpattern specifies Apache as a requirement, which WordPress does not). It also means that PHP developers can easily extend Textpattern if they so choose. However, what really sets Textpattern apart from the competition is its integration of Textile, and its Sections feature. Textile is a tool that allows the easy formatting of Web content by those who don’t know HTML. It’s described as a "humane Web text generator" by its author (a demonstration of Textile is available). Textile makes it easy for those who don’t know HTML to format their entries with headings, links, images, lists, and more using just a few simple characters, which Textpattern converts to HTML for publication. Textile formatting is available for WordPress and Movable Type as well, but for these packages, it’s not the default publishing method like it is in Textpattern. This functionality makes it easy for non-developers to start writing quickly. Another powerful feature that’s built into Textpattern is Sections. Sections allow for the easy separation of various types of content in better ways than most normal category classification systems can. Each Section can also use a different template or style sheet, and have its own publishing settings, such as whether entries in that section show up on the front page listing, or in syndication feeds. This is very useful if you use Textpattern for more than blogging purposes. For example, a Web developer might use Textpattern to run his or her business site, setting up one section for portfolio entries, and another section for news and announcements. Textpattern is also much more resistant to comment spam than both WordPress and Movable Type. Features such as forced comment preview (meaning that a visitor to your site must preview their comment before it is approved) all but eliminate automated spam attacks, and since Textpattern is used less frequently than WordPress or Movable Type, there are less attacks targeting it specifically. On a personal note, when my blogs were running Movable Type and WordPress I would have to clear out spam at least every few days. Since I migrated to Textpattern four months ago, I haven’t received a single spam comment. Textpattern is licensed under a dual-license model. For personal use, Textpattern is free to download and is licensed under the GNU General Public License. Different pricing and licensing models may apply for business use; check the TextBook page on licensing to see if your application meets those requirements. While Textile is very powerful, there is also a bit of a learning curve associated with it if you want your content to come out a certain way. This may catch new users off guard at first, but most people tend to get through the learning curve quickly. One glaring omission from Textpattern — one that both Movable Type and WordPress include — is Trackback. Trackback is a technology that allows other blogs to alert your site when a topic related to one of your entries is published. Usually, a Trackback will append a link to your site from the other blog, which is useful if you are trying to become a well-known blogger. However, the downside of Trackback is that it can be abused for spamming purposes, so you may save time by not having to manage irrelevant comments. Finally, at the time of writing, Textpattern’s latest release is still not stable: it’s a release candidate. If you’re the type of person who must use stable software releases, then you may have to wait a few more months before you will feel confident to use Textpattern. Each of these systems has its good features, as well as features that may not be as well developed as those offered by the competition. Below is a side-by-side comparison of the considered packages, based on criteria that most Web professionals will look for in a blog software system. The rankings are based on a 1 to 5 scale, 5 being highest. Which Package is the Right One? If you add up the ratings assigned above, the assessment favors WordPress over Movable Type and Textpattern, but it’s important to remember that no single package is perfect for everybody, or every type of content. The different strengths of these products make each particularly suitable to particular circumstances. Below is a quick explanation of a situation in which each package can be put to its best use. Movable Type, while being the most likely target for spam, is the only option in many scenarios. If you need the simplest administrative interface, or you need to manage multiple blogs from one place, there is no better way to go. Movable Type is also your only option of the three if you can’t use MySQL as your database: it’s the only option that supports multiple database systems. Finally, Movable Type is best for those who value having support and accountability from a single company — something that can’t be obtained with the open source solutions. Just make sure your host will allow you to install Movable Type on their servers. WordPress is a great package for the technically inclined. If you’re a PHP developer who likes to tinker with the internals of an application, then WordPress is likely right up your alley. WordPress is also the best fit if you want to manage static content through the same interface as your dynamic content — thanks to its Pages feature — and the flexibility in its configuration options, and easy setup, make WordPress tough to beat. Textpattern, the system I’ve chosen, is best for those whose primary purpose is publishing content rather than maintaining a Weblog installation. It may also be the package of choice for those who don’t want to deal with comment spam, at the expense of losing the ability to send and receive Trackbacks. 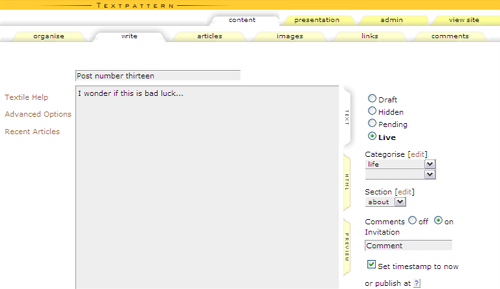 Textpattern is also a great fit for general Website management, given its handy Sections feature. No one package I reviewed is better than all others in all situations, though some do suit certain situations better than the others. If your blog meets the criteria I laid out for a particular package, then you should give it some consideration. Otherwise, try them all out, and see which one works best for you. The right package should be the one that optimizes the productivity of your Web content publishing: that’s all that matters. Vinnie is a Web developer living in Philadelphia, with over four years of experience building Websites and applications for companies in the real estate and software fields. He has also maintained his personal Website and a Web design blog for over two years.